Zen Baby was created by two long term friends with the vision to promote a sense of peace and well being so that baby and caregiver can become receptive to the beauty and inspiration in life. They did this by creating a wonderful DVD that both parent and child can enjoy. I was sent a DVD of Zen Baby to review about a month ago. Before this, our bedtime routine was not really a routine at all. We tried different things on different days depending on how close it was to bed time, how cranky Baby Bird (or Mama Bird) was or how late dinner ran. I first tried Zen Baby on a weekend day when Papa Bird was working. We had a nice ‘girl-time’ dinner, she played in the bath, then I sat us both down and popped Zen Baby in to the DVD. I sat on the floor with a comfy fleece blanket on my lap and her hairbrush and we began to watch the DVD. She stood up and wandered a bit, then came to me and sat down, then back up again. She had an eye on the TV the whole time and danced a bit to some of the music. There was something slightly different about her that night though. She was more relaxed than before, and she fell asleep in less than a minute when it was bedtime. I didn’t even have time to put her in her crib to fall asleep on her own. I thought it must have been the nice bath, so we tried it again the next night, and the next. Now this DVD goes on every night about 45 minutes before her bedtime. She used to get up and walk around a bit, but now she just sits, cuddles and lies across my lap with her milk and watches it. I enjoy watching it too. Spending this quiet time with her has become one of my favorite moments in the day and I look forward to it. It’s kind of like my own time out at the end of the day. I get a chance to sit quietly with her and wind down. The DVD is broken into 11 sections and has a theme to each one such as “Good Morning, Baby”, “Let’s Play”, “Colors Colors Everywhere” and “It’s the End of the Day”. The score is perfect for the show. It has many different instruments such as drums, body percussion, piano and guitar. Zen Baby also incorporates the sounds of nature; running water, wind through the trees and waves on the beach are just a few of the relaxing scenes throughout the movie. The music and sounds aren’t overpowering which is nice because I can talk to Baby Bird about what we are looking at and I don’t feel like I have to compete with the music. Each image also stays on the screen long enough for me to name it or make a comment about it for Baby Bird, but short enough so that she doesn’t get too bored of it. Can you tell I really love this DVD? I do… and so does Baby Bird. She gets completely into it and actually sits to watch it and her favorite part is during the “Let’s Play” chapter where one of the babies claps. She always sits up and claps with him so I know she is paying attention. While I know that all infants are different, I recommend you try this DVD out as a part of your little ones bed time routine, or even for a break in the day for your little one to help calm them down. I received this DVD from Zen Baby to review but honestly, if anything ever happened to this copy, I would be online buying myself another one right away. 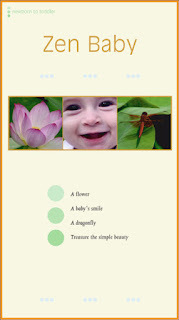 Zen Baby is great for newborns to toddlers and is available in VHS, DVD or DVD/CD combo. The DVD retails for $14.98US and is available online through their online shop. To enter: Leave a comment at the end of this post… simple as that. Please leave a way of getting a hold of you should you win. *You must do this for any additional entries to count. Become a public follower of This Bird’s Day (either in the right sidebar or through Facebook at the bottom of this page). Follow This Bird’s Day on Twitter AND tweet about this giveaway linking to this post. Please include your twitter id in your comment (you must do both for this one to count). Be a confirmed email subscriber to my updates (at the bottom right of this page). Simply enter your email address, confirm it and you will receive email updates when I make a new post. This will let you know when there is new content and giveaways on my site. This contest is open to Canadian and US residents and runs until 9pm MST on Friday, December 11, 2009. Comments are now closed for this giveaway. Thank you and good luck to everyone who entered. I will draw a winner shortly. I'm one of your FB fans. I'd love to win this for my baby girl! This sounds great!! My baby girl has always had a hard time falling asleep – I am willing to try just about anything!! Would be great for our newborn and toddler! I am ready to try anything! Sounds like a great DVD for my daughter.